Ladies and gentlemen, the wait is finally over! On today’s historic day, India’s fastest train has been flagged off for journey. The Gatiman Express runs between the capital city of Delhi and history city Agra. The 188 km distance is usually covered in 3 hours by other vehicles. Gatiman takes only 100 minutes to reach the Agra cantonment from Delhi’s Hazrat Nizamuddin station. This is possible only because the train moves at a speed of 160 km/h. The country’s railway department applied for safety certificate from the commission of railway safety in the year 2014. In 2015, the train was officially announced. It was given the number 12049/50. On 5th April 2016, the train began its first journey. Several trail runs were done in the past two years to approve the commencement of the train. The train goes to and fro between Delhi and Agra in one day. It leaves Delhi at 8.10 in the morning and reaches Agra at 9.50 in the morning. It begins the return journey at 5.50 in the evening reaching Delhi by 7.30 in the evening. It runs every day of the week sparing Friday. Electricity, air conditioning, Wi-Fi and GPS are the few facilities that you can avail on board. There are twelve coaches in total, two executive AC car coaches and eight AC car coaches. The pricings are – 750 Rs for regular AC coach seat and 1500 Rs for executive AC coach seat. You can check seat availability on IRCTC website. The semi high speed train has automatic fire alarms, sliding doors and hygienic toilets. IRCTC is looking after the catering involved with the train. You are in for a treat with a vast variety of vegetarian and non vegetarian food that is served on the train. The executive passengers get to eat their meals on fine bone china cutlery. The cuisine includes south Indian, north Indian, continental, Italian and health food. Myfreetv.in is a private company that provides free on board entertainment. People can watch TV on the 8 inch LCD screens on the back of each seat. 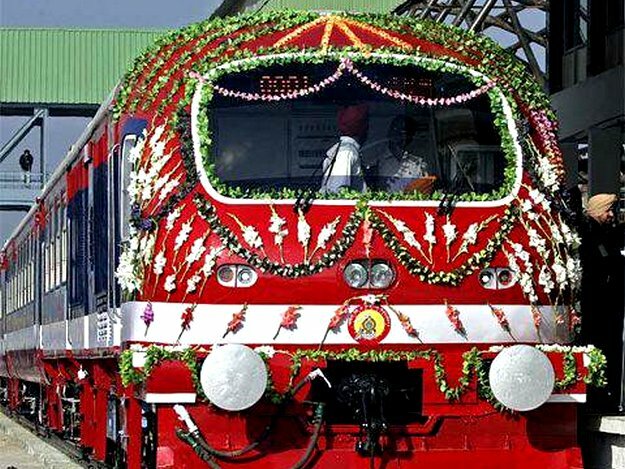 The train has new Linke-Hofmann-Busch coaches made by the Rail Coach Factory in Kapurthala. For the first time in the history of Indian Railways, hosts and hostess are going to take care of the passengers. Dressed in blue uniforms specially designed for them, the hostesses are going to make you feel at home on the train. With such state-of-the- art facilities, Gatiman express will be a success among all the express trains running in India. Do not forget to experience this unique journey if you are travelling between Delhi and Agra. Top Luxury cars in India – The automobile industry in India has seen a real surge in the last decade or so with a lot of luxury automakers coming out with some of the most premium models in the country which is something that we have not seen previously.